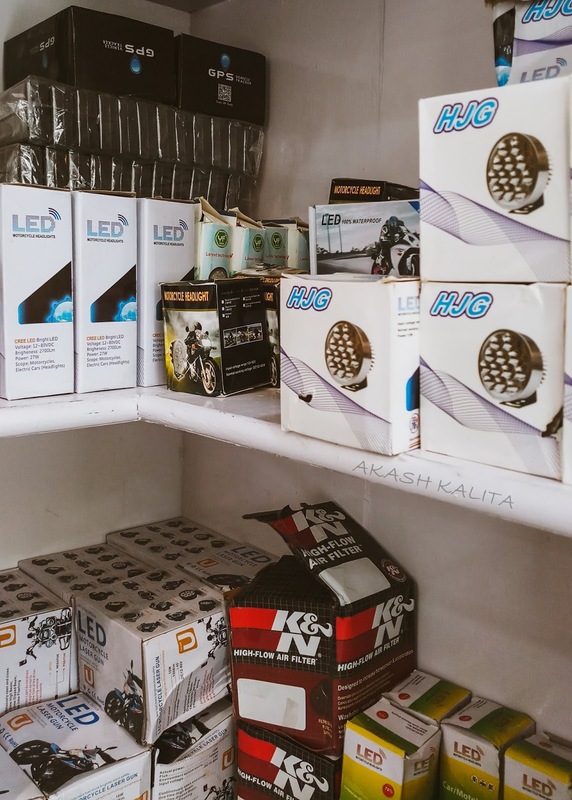 Bikers Cafe, Guwahati, has a wide range of motorcycle accessories and riding gears, that too at prices that will not burn a hole in your pocket. There is so much so, that if I had to make a list of the items, it will fill the entire blog. Therefore, for the sake of convenience, let us put them under broad categories. And to start with, let us start with my favourite section, i.e. 'Riding Gears'. 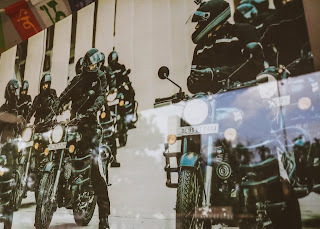 If you are on a motorcycle ride, the most important aspect is safety, because you would want your ride to be memorable for things that filled your heart with joy and not things that will discourage you to ride again. So, it is important to invest in good quality riding gears. Bikers Cafe has plenty of riding gears that will ensure safety while you are having a blast on your epic motorcycle journey. 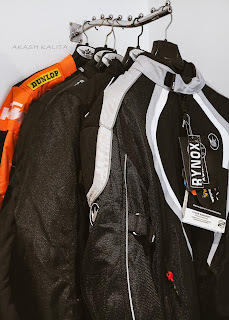 There is a wide range of genuine riding jackets and riding pants from Rynox and Mototech. These are all weather jackets and come with detachable rain and thermal liners. So, you do not have to worry about wearing any of these even during monsoon and winters. Then there are knee and shin guard from reputed brands like Scoyco and ProBiker. There are blogs available both about Scoyco Jacket and ProBiker gloves on my site www.akashkalita.com, so you can refer to them as well, for user experience review. Our head is the most important part of the body, and even a small injury to it can be fatal. Therefore, it is extremely important that we take utmost care for its protection while riding a motorcycle. 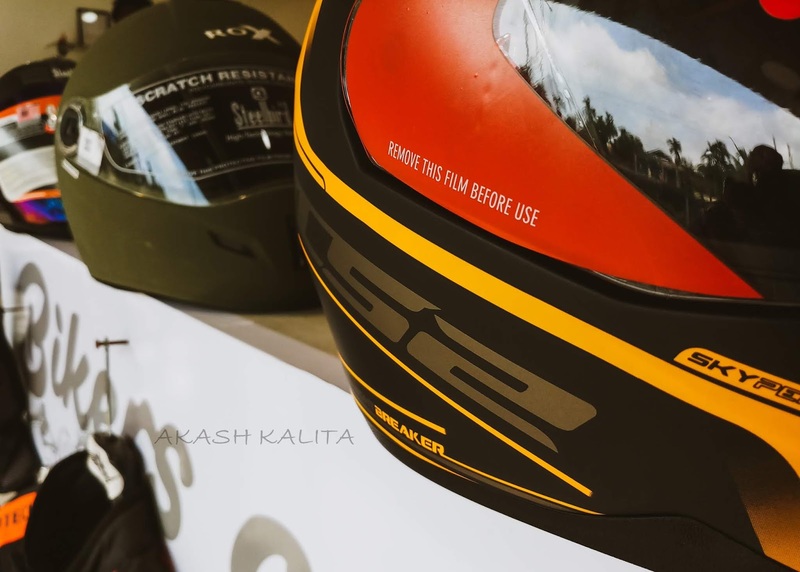 There are many stylish helmets from trusted brands like Steelbird and LS2 available at Bikers Cafe, to ensure safety for the head while you look good on the roads. 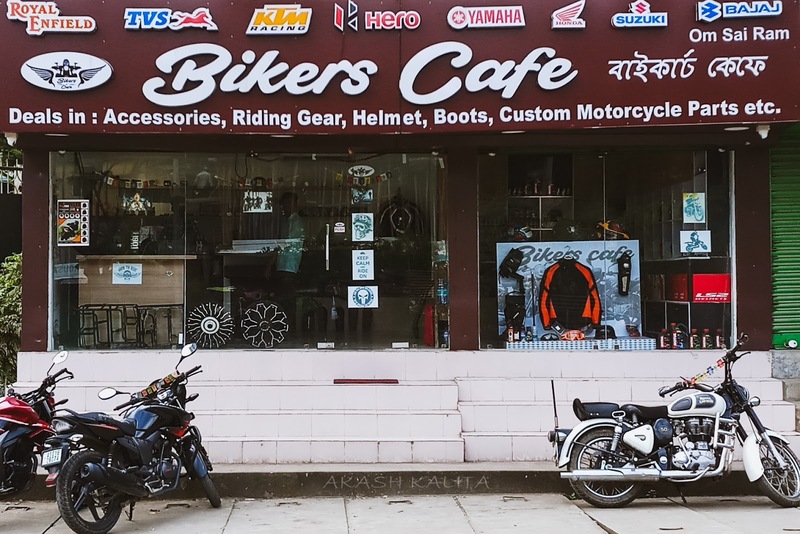 And if you are looking for bluetooth, and intercom connectivity for your helmet then, Bikers Cafe is the place to visit. The gloves provided by ProBiker are of good quality, considering the price at which they are made available at, are also available there. 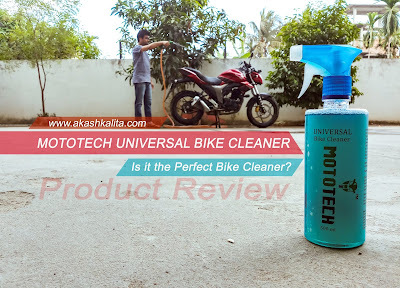 For the user review of ProBiker riding gloves you can check out my blog on my site www.akashkalita.com. 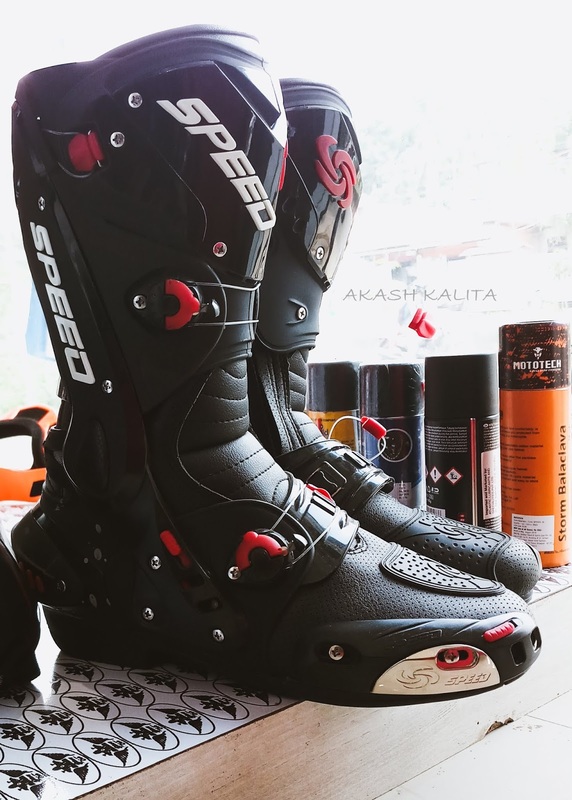 And if you are searching for ProBiker Speed Riding Boots, they are available at Bikers Cafe, so go and check them out. Do you want those cool looking 'dirt bike - goggles' but, do not know where to get one of those? Yes, Bikers Cafe has those too. And not only goggles they have a wide range of uber cool range of masks, bandana, and tattooed sleeves too, to protect your skin from those harmful UV rays from the sun. 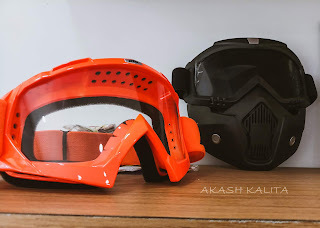 The cool black 'transformer type' mask in the picture is a two piece unit, which means that, you can separate the mask and the goggles, and wear the goggles separately with your favourite 'dirt bike' helmet. 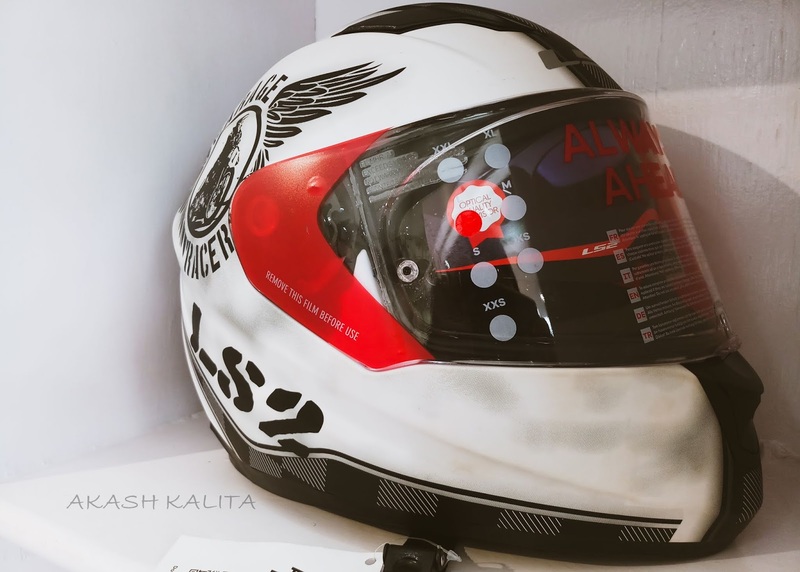 We, the motorcycle enthusiasts, always want our motorcycles to look unique, to make it look different from others. We want our rides to stand out in the crowd. 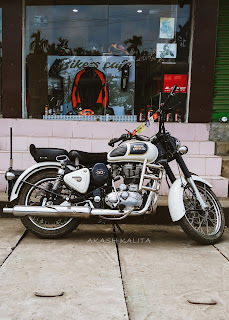 And with the collection of every kind of motorcycle accessories, the Bikers Cafe does not disappoint in this aspect either. Alloy wheels, fog lights, LED headlights, crash guards, clutch and brake lever guards, handlebars, foot pegs, headlamp covers, bar end mirrors and lights, indicators, handlebar cross-bars; you name it and they have it. 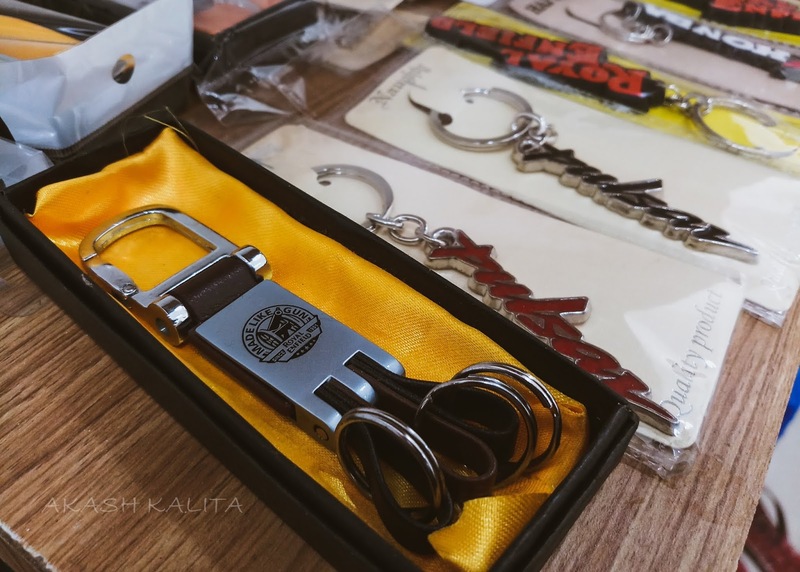 They also have a unique collection of quality key chains. 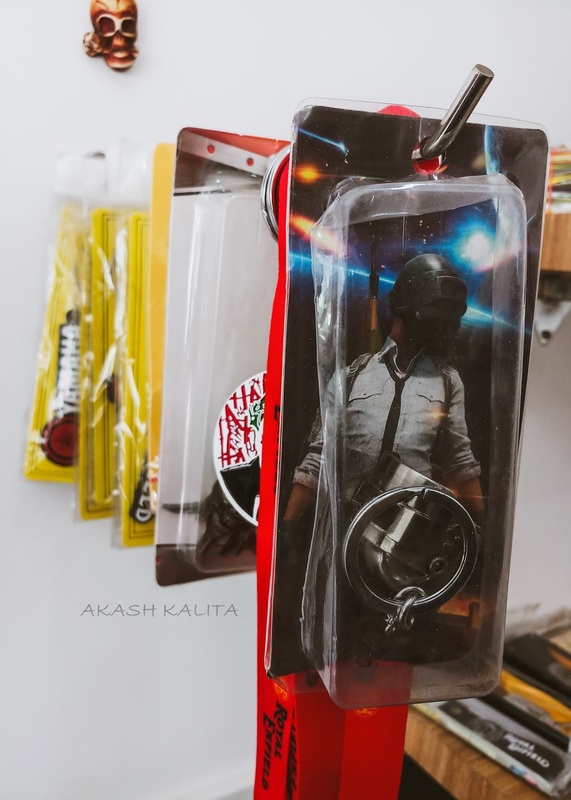 And if you happen to be a PUBG fan, then you would not want to miss that famous PUBG helmet key chain available there. With increase in the rate of vehicle thefts, it has become important to invest in security products. If you want your bike to be safe and prevent it from being stolen, you can get a GPS installed to track the location of the bike, or install central security locks with remote on your bike. You can check Bikers Cafe for these products too. They have bike body covers too, to protect your bike from rain, dust, and those children from your neighbourhood, who does not miss any opportunity to show their creativity with sand paintings, and stone curving on every vehicle they can lay their hands on. Traveling on a motorcycle is a peaceful experience but installing luggage on them is not. But, installing luggage carriers, commonly know as Ladakh carrier in India, on your motorcycle can make things easier. 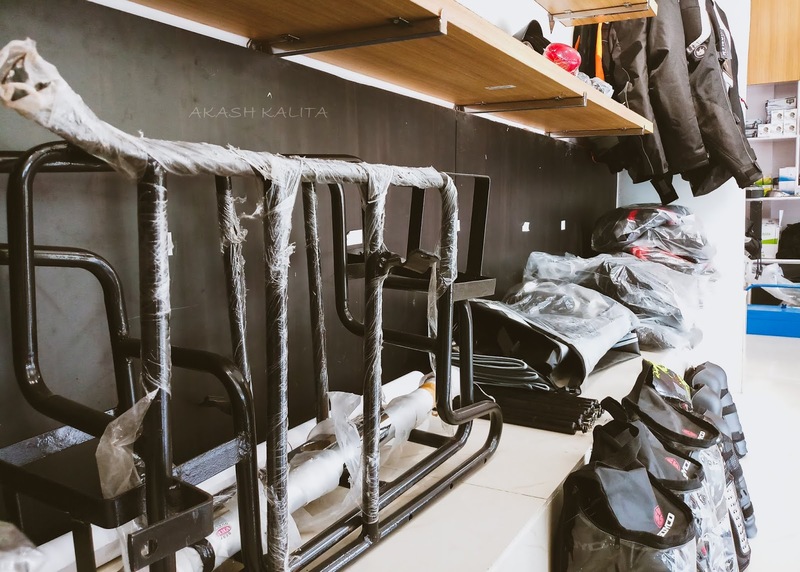 Bikers Cafe has Ladakh carrier, cords to tie your luggage, luggage bags, waist bags, back packs, i.e. almost everything that you would want, to secure your luggage on your bike. But, in the end when your journey is about to end, your brain wants you to go home and sleep but, your heart never wants the journey to end. 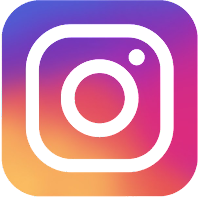 So, you might want to relive those epic moments of your journey later too, by looking at the pictures or watching the videos that you captured on your journey. Therefore, you would never want to miss to capture any of the action on your journey. So, check out the action cameras available in Bikers Cafe and one of them might prove to be the right companion for you. Your motorcycle is always there for you when you need it. And you would never want it to break-down in the middle of nowhere, on an otherwise beautiful motorcycle ride. 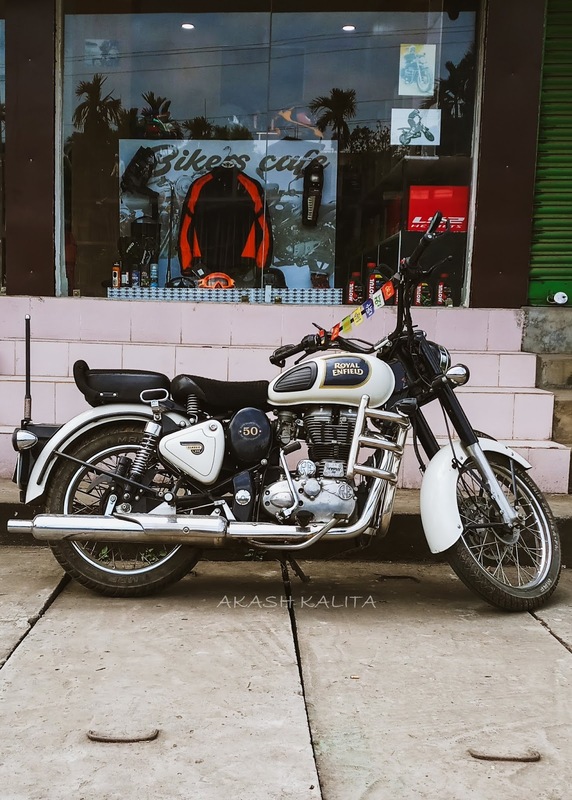 Therefore, it is always important to provide proper maintenance to your bike so that, it proves to be a great companion for the roads even on the longer run. 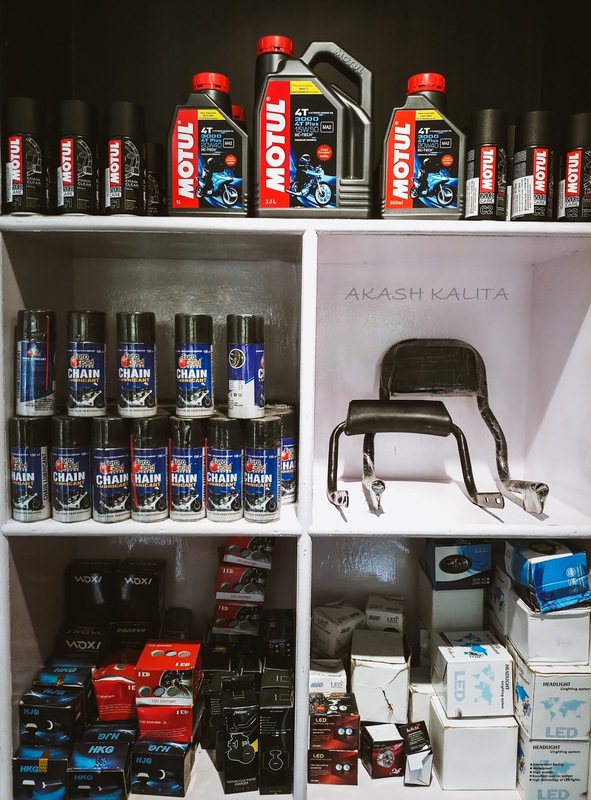 To show your care for your bike, you can invest on products like, air filter, polish, chain cleaner, chain lube, and engine oil, to keep it running smooth. You can take a stop at the Bikers Cafe for all these product too. To sum it up, Bikers Cafe, with its wide range of products, enough space to park your ride, great hospitality, friendly staff who would not only guide you to select a product but also, get it installed on to your beloved machine with care, makes it a great pit-stop for every motorcycle enthusiast there is. Lastly, I would like to add that, this is not a sponsored blog post but, is a written form of what I have experienced at Bikers Cafe, Guwahati. 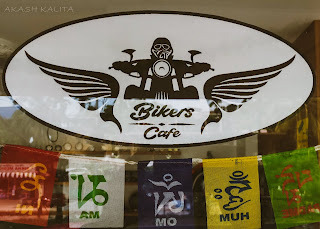 I would like to extend my gratitude towards Mr. Murphy, owner of Bikers Cafe and a motorcycle enthusiast himself, for allowing me to write this blog about his store. I will leave the contact details of the store below so that you can contact, and visit the store without any hassle.